This blog has is a meditation to clear neg speak from the human EMF. This is helpful when the astral stories begin to go on and on in a negative way. On Friday and Saturday evenings (when people use recreational drugs and watch violence on television). Also, during times of high solar wind speeds and when the Kp index is in the red. For the former, see “Space Weather,” http://www.spaceweather.com/ top left … high speeds are 600 or 700 km/sec. For the latter, check the same webpage, half-way down on the left, for the Planetary K-Index; storm conditions are Kp5 to Kp9. The times for you may be different. At any rate, when the astral stories get out of hand, this means that the chakras, which are important gears in the human EMF array, become imbalanced. 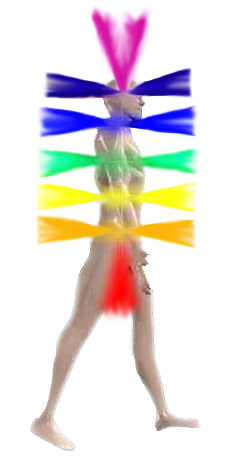 Image: Human chakric vortices, old-style: http://www.curativesoul.com/images/chakra-funnels.jpg .. This old-style chakric chart doesn’t take into consideration the new post-Ascension chakras, one of which, the Soul Star chakra, is mentioned below. A front vortical funnel can become attached to that of an entity, human or nonhuman, in physical or astral form, with whom there is a resonance of liking, love, or attraction. This distorts the energy of the front funnel outward, away from the spine. A back vortical funnel can become attached to that of an entity, human or nonhuman, in physical or astral form, with whom there is an emotional resonance of dislike, hatred, fear, or repulsion. This distorts the energy of the back funnel inward toward the spine. The top funnel, the violet funnel of the crown chakra, and the bottom funnel, the red funnel of the basal chakra, are each subject to the energies of both attraction and repulsion. In fact, on a difficult day, each funnel can become attached to that of a different entity, human or nonhuman, in physical or astral form, with whom a subconscious astral conversation is taking place. While I describe the astral stories as originating with emotional connection of each of our chakric funnels with that of another entity, whether human or nonhuman, the story does not end there. The Glom Effect. The emotional affect of this primary layer of astral connection radiates out to all our friends and family, and from there, in a more diluted way, to all their friends and family, and so on, through many layers of astral connection. In this way the glom effect takes place. This glom effect is detrimental to humankind, in that it can lead to acting out of negative astral stories in the form of violent or feral behaviors. Lie down on your back in a quiet room. Lie down flat, without a pillow beneath your head (this is important). Consciously relax the muscles in your body, starting at your toes, and going on up the body and limbs to the top of the head. Place your awareness on a spot 3 to 6 inches above your head, where the Soul Star chakra (one of the new post-Ascension chakras) is located. Visualize the light there expanding to a column of diamond white light as wide as your body, and a foot or two tall. When that energy feels spacious and clear, then your crown chakra energy will also be in balance. Then go on to the next step …. Now place your awareness on the back of your head, where it touches the surface you’re lying on. Keep your attention on this spot until the astral story taking place in your 6th chakra (also known as the third-eye point, and related to the pituitary and pineal glands) stops. In each case, continue to place your awareness on the physical place on your body until the astral story or stories associated with this area of the body cease. Then, with a feeling of gratitude, rest for 10 minutes or so. This entry was posted in Acting out - ahimsa - nonviolence, Astrogeophysics - EMF - hologram, Chakras, Glom effect, Malware - malspeak - implants, Meditations - visualizations, Solar events - geostorms, Yoga and tagged 2u3d, acting out, astral stories, astrogeophysical, Chakras, excrement, Glom effect, malspeak, meditation, neg speak, rebalance chakras, solar storms, solar winds, water enemas on 26 November 2016 by Alice B. Clagett.